Does Your SEO Expert Know What They're Talking About?? - Wood Street, Inc. The number one most important thing to focus on when trying to build traffic to your website is… content that your target audience can use! That’s it, top dog. No debate. And yet, there are so many SEO “experts” out there who seem to either miss this or ignore it altogether. I am a partner at a web design and development firm. I know a few things about SEO. First of all, did they even read our services page before they called? Doubtful. We rank very well and get great traffic. And yet, they seem to know something we don’t. They have the secret! Whew. So glad someone knows the secret. Yes, I’m being a tad bit snarky here. But, it drives us insane that so called experts are feeding good, reputable companies a bunch of malarky. SEO firms who are great at what they do will probably not be cold calling you. Most of these companies are one trick ponies. They found a solution that worked and continue to use that again and again. Great! You’re getting traffic, awesome! Is it converting? Are you building trust? Is this sustainable? What happens when Google changes the rules? Are you safe? The only way to truly know you are safe is to always focus on delivering great content to the user. Focus on their experience. Focus on giving them what they need. Google is smart enough to see this and rank you accordingly. If you try to game the system, think about who you’re up against… a bunch of very smart programmers whose job it is to sniff you out. There are Meta tags that Google will use but Meta keyword tags have no impact on ranking whatsoever. 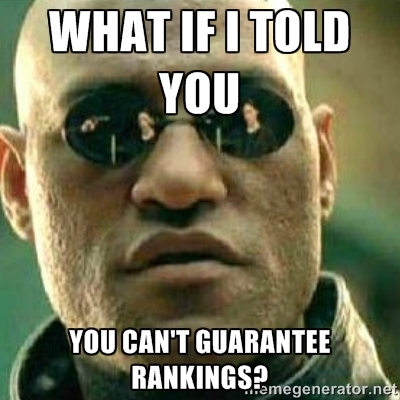 Meta descriptions, while they don’t directly impact ranking, do have some importance in terms of traffic. Google will use your Meta description in the listing (or some version of it). So, it is a good idea to have a compelling Meta description. But, it has very little to no impact on the ranking of your website. It’s the content, the utility content that matters. And unless they are discussing code, they’re either pitching advertising or snake oil. I have to say that many companies have highly complex web presences that include numerous sub-domains, servers, and even separate CMSs. In such cases there are some serious SEO skills involved that go way beyond content. There’s also quite a bit of know-how involved with properly setting up XML sitemaps for news, video, etc., properly annotating mobile sub-domains to get the full search value, microformats and schema for rich-snippet results in the SERPs, SEO-friendly infinite scroll and AJAX experiences using progressive enhancement techniques…the list could go on and on. But the reality is most SEO companies who are cold-calling you don’t fully understand all that. That’s what makes companies like mine different. For small businesses running WordPress with a well-conceived, keyword-researched information architecture, a ongoing investment in high quality content is absolutely what matters most. I should have said perceived SEO companies. Yours is one that I respect immensely as you know. In fact, there are many SEO experts and companies I have a great deal of respect for. This is not about any of them. This is about the hucksters who take advantage of small business owners just trying to market themselves online.